Friends of Sound Horse (FOSH) is pleased to announce the Award winners for the 2014 FOSH Gaited Distance Program. The FOSH Gaited Distance Program is a Division of the FOSH Gaited Sport Horse that records, recognizes and rewards gaited horses involved in the sports of Competitive Trail Riding, Limited Distance and Endurance Riding. Entrants included the Icelandic Horse, Spotted Saddle Horse, Tennessee Walking Horse, Kentucky Mountain Saddle Horse, Single Footing Horse, Missouri Fox Trotting Horse, Paso Fino and Rocky Mountain Horse. The high mileage award winner was a Kentucky Mountain Saddle Horse in the Endurance Division. Predominio de la Armistad, a Paso Fino, owned by Susan Crawford of York, PA was the award recipient in the Light Weight Division of the Competitive Trail Category. The Reserve in this Division was the Paso Fino, Illuvia de la Pluma, also owned by Susan Crawford. Dancer’s American Beauty, a Tennessee Walking Horse owned by Dorothy Foster of Oroville, CA was the winner of the Limited Distance Award in the Lightweight Division. The reserve in this category was also a Tennessee Walking Horse, Scarlet Ribbons Gold Rush owned by Valerie Lewis Jaffe of Ennis, TX. Mocha Jack, a horse familiar to those in the sport of Endurance repeated his win from 2013 by capturing the Endurance Lightweight Division. This Kentucky Mountain Saddle Horse is owned and ridden by Becky Lange of Santa Maria, CA. The reserve in this Division was also a repeat winner from 2013. The Tennessee Walking Horse Ebony’s Bravo Moon was reserve in the Lightweight Endurance category. Owned by Laurie Henschel of Clintonville, WI, he was the 2013 winner of the Limited Distance Award. Champagne Supernova, a Singlefooting horse owned by Laura Horst of Cool, CA was the winner in the Endurance Lightweight Division. Mocha Jack captured the Overall High Milege Award by logging the greatest number of competitive miles in any Category. In earning these miles, Mocha Jack had 12 top ten finishes including 1 first, 1 second, 1 third, 2 fourths, and 2 fifths. This Kentucky Mountain Saddle Horse is owned and ridden by Becky Lange. The Tennessee Walking Horse, Ebony’s Bravo Moon owned by Laurie Henschell was reserve. Stonewall Saddle Company was the sponsor of the High Mileage Award. FOSH thanks all gaited horse owners who supported the GOSH Gaited Distance Program in 2014. We look forward to the 2015 competitive year and the opportunity to recognize and reward gaited horses who compete in the equine sport of Competitive Trail Rides, Limited Distance and Endurance. About FOSH: Since 1998, FOSH is the only national organization dedicated to the promotion of the sound gaited horse emotionally, mentally and physically; fair competition; and humane training and education regardless of breed or discipline. Lexington, Ky. - Following a comprehensive review of the position, the United States Equestrian Federation (USEF) is seeking a U.S. Endurance Chef d'Equipe/Technical Advisor. The job description and application can be found here. Individuals interested in serving as the U.S. Endurance Chef d'Equipe/Technical Advisor must submit an application no later than Wednesday, March 11, 2015. For more information regarding the process of hiring the U.S. Endurance Chef d'Equipe/Technical Advisor contact Kristen Brett at kbrett@usef.org or 859.225.6919. Elite endurance horses have bigger hearts than their less successful fellows, according to a recent report in the American Journal of Veterinary Research. Dr Meg M Sleeper and colleagues examined 34 Arabian endurance horses. Based on their performance in a recent competition, horses were classified as elite (23 horses) and less successful (11). Does the current format of American Endurance Ride Conference (AERC) suit your needs and desires? Are there some changes or additions that you feel could enhance your experience or help grow the sport of Endurance Riding in the United States? This will be a Hot Topic discussion at the AERC Convention in Reno, March 6 so let us know your thoughts. All responses to this survey are anonymous. Or if you like the sport the way it is, please take the time to tell us that too! This survey is being conducted by www.Endurance.Net and responses will be shared with the AERC Board of Directors, as well as the larger community of Endurance Riders. On Thursday evening March 5, 2015, at the Old State Theatre in Auburn, California, Clinton Anderson will be the guest speaker at "Tevis Talks", sponsored by the Western States Trail Foundation. Australian Clinton Anderson and the Downunder Horsemanship Method have helped thousands of horses and riders. He is committed to inspire the dreams of horsemen and horsewomen everywhere. No-Host open bar begins at 6 PM; talk hosted by Matt Scribner begins at 7:30 PM. Signature "Gold" tickets are $175; Signature "Silver" tickets are $75; General Admission tickets are $40 in advance or $45 at the door. or call WSTF at 530-823-7282 for more information. A "Book Barn" will join the Trade Show vendors at the 2015 AERC Convention in Reno, Nevada, on March 6 and 7. Authors Aarene Storms (Endurance 101), Sharma Gaponoff (Tevis, From the Back of My Horse) and Merri Melde (Soul Deep in Horses: Memoir of an Equestrian Vagabond) will be present to sign their books or CDs and entertain with tall tales of their endurance adventures. Books by other endurance authors will be available, including Karen Bumgarner (America's Long Distance Challenge II: New Century, New Trails, and More Miles), Leonard Liesens (Endurance: A French Perspective), Dodie Sable (To Finish Is to Win: One Woman's Riding Adventures, and A Day in the Life Of… ), Julie Suhr (…but it wasn't the Horse's Fault), and Steph Teeter (Training and Event Journal - cartoon style). Hooray for AERC's fabulous ride managers! AERC is successful only because of the dedication of all our ride managers. We are seeking donations of ride entries to include in the AERC convention raffle. These are always sought-after prizes at the popular raffle booth. If your ride is/was before the convention on March 6 & 7 (this year's convention dates), please consider donating an entry to your 2016 ride. You can send a certificate to the AERC office or just send word by reply e-mail and we will make up a certificate for you with the ride name, date, etc., and your contact information. We'll have the certificates up on the raffle table at the Grand Sierra Resort in Reno for all members to check out, and will be handing out flyers listing all the ride managers that have donated entries. We hope to have lots of ride entries in our raffle! They are a highly-sought after raffle prize by the attendees. Thanks again for your hard work and dedication to the sport. Please let us know if we may be of any assistance. Have you registered for the 2015 AERC Convention yet? Tomorrow, Friday February 20, is the last day to register for the AERC Convention Speaker Seminars at the discounted rate. The Convention will be held Friday and Saturday, March 6 and 7 in Reno, Nevada. Email your registration forms on or before February 20 for the discount. After February 20, all registrations received will be processed at the on-site rate. Additionally, cancellations received after February 20 will be assessed $10. No refunds for no-shows! The photographs are breathtaking, the idea for the enterprise and how they were able to carry it out equally so. 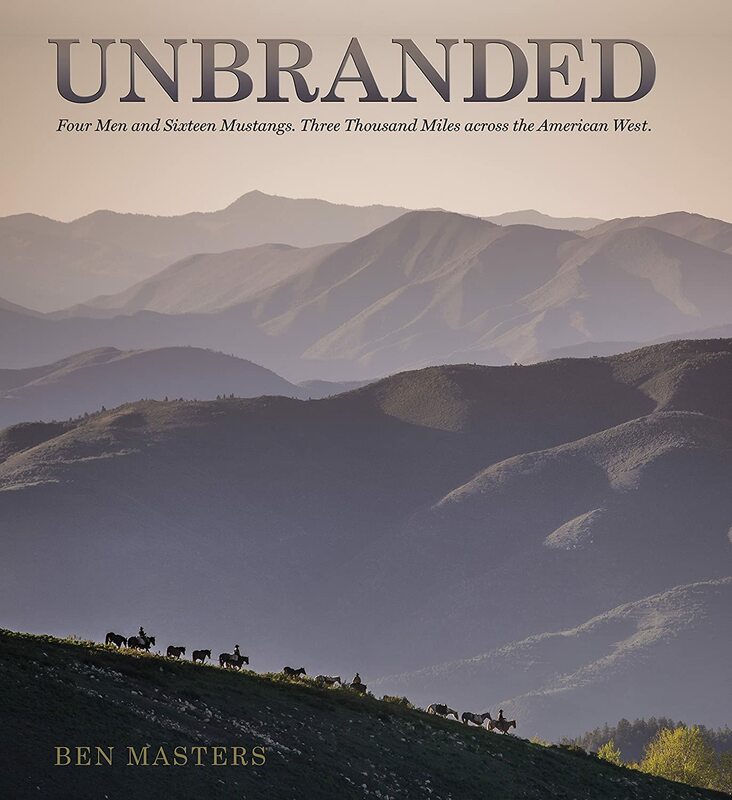 In Unbranded, author Ben Masters tells the story of how he got the idea that what he really needed to do was to ride horses across the American West. He recounts how it started at Texas A&M University "one of the few places in the world where you can find people crazy enough to ride a horse for thousands of miles." Masters had undertaken a long-distance riding trip with a friend -- four months and 2,000 miles -- on quarter horses. When he decided to do it again, he says he realized he needed a different kind of horse, one more adaptable to back country hardships. Last week, the National Forest "trails bill" that Back Country Horsemen of America supported last year was reintroduced in the U.S. House of Representatives by Cynthia Lummis (R-WY) and Tim Walz (D-MN). The bill, the National Forest System Trails Stewardship Act (H.R. 845), continues to spur high-level dialogue and a search for solutions to the growing trail maintenance crisis on our national forests. BCHA strongly supports H.R. 845. You can click here to read the text of the bill as introduced. The bill was introduced at the request of BCHA and our partners, The Wilderness Society and American Horse Council. It responds, in part, to a June 2013 report by the Government Accountability Office (GAO) that reviewed the status and causes of the Forest Service trail maintenance backlog. • Prioritize specific areas for trail maintenance within national forests. Please call or write your congressional representative to express support for H.R. 845. As a result of widespread bipartisan interest, the bill could move quickly through the House of Representatives if no controversial provisions or requests for new appropriations are added. We also hope to see a companion bill introduced in the Senate soon. Go to this website to find contact information for your member of Congress. In your own words, tell your representative why you support H.R. 845, the National Forest System Trails Stewardship Act. Tell them of your passion for, and commitment to, keeping national forest trails open and enjoyed by horsemen and others. Lastly, please ask them to consider co-sponsoring H.R. 845. If you are a resident of Wyoming or Minnesota, please include in your message a heartfelt "Thank You!" to Representatives Lummis and Walz, respectively, for introducing H.R. 845 on behalf of the Back Country Horsemen. Feel free to share copies of your letters (quietrecreation@gmail.com) with BCHA's Advisor for Public Lands & Recreation, including any response you receive from your member of Congress. BCHA is excited to have this bill reintroduced. Our campaign has taken nearly three years to get to this point. Consequently, we believe BCHA is well-positioned--along with its partners--to continue to explore and promote lasting solutions to the trail maintenance crisis on our National Forests. Thank you! And please call or send letters today to you congressional representative in support of H.R. 845. Journalists are invited to attend the AERC Conference Seminars free of charge. AUBURN, California – February 18, 2015 – Endurance competitors and enthusiasts from all over the United States will gather on March 6 & 7, 2015 at the Grand Sierra Resort, in Reno, Nevada for the annual American Endurance Ride Conference (AERC) Convention. The agenda features a wide array of informative seminars and discussions on topics of top interest to participants in the sport of endurance. For more info, and to register and receive the best pricing on conference seminars, please visit http://www.aerc.org/2015Convention.pdf and register before February 20. Conference attendees always enjoy the popular annual Tack Swap that allows riders to pick up tack and related items at bargain prices, with 10% of proceeds benefitting the AERC. Attendees can also attend the free trade show which runs Friday 9-6 and Saturday 9-5 and features a wide variety of vendors that offer a great opportunity to purchase the type of gear distance horses generally use. John Parke will host two free early-morning ‘Hot Topic’ workshops where endurance riders can participate in thought-provoking discussions. This year’s topics include “Cooking Up an AERC Ride: Should We Change the Recipe?” and “Fishing for Members: Casting the Net Without Tossing ’em Back” led by Patti Stedman. · National Awards Banquet. AERC’s top riders and equines for the 2014 season will be honored at Saturday’s banquet. Also recognized will be the Hall of Fame and Pard’ners Award recipients and equines who have reached 5,000+ endurance miles. Don’t miss this special evening. · Regional Awards. Winners of regional mileage, points, and best condition awards for endurance and limited distance will be celebrated and acknowledged at a ceremony/reception on Friday from 6:00 to 8:00 p.m. Everyone is welcome. · Friday Night Dance. Come mingle and dance at this always-fun evening of music, dancing and celebration. · Raffle. The popular AERC raffle drawings take place during trade show hours (tickets: $1 each). Most vendors make donations to the raffle, and numerous ride managers from all regions will be donating ride entries. If you have items you’d like to donate to the raffle, bring them by the raffle booth at the start of the convention. Raffle benefits AERC. · General Session. This open forum meeting, held Saturday at 11:00 a.m., offers members an opportunity to speak directly with AERC board members. Come and express your views on the direction of the organization and the sport of endurance riding. Election of officers by the AERC board of directors will also take place during this session. · Committee Meetings. Most AERC committees meet during convention. Meeting times will be posted at the convention. In addition to promoting the sport of endurance riding, the AERC encourages the use, protection, and development of equestrian trails, especially those with historic significance. Many special events of four to six consecutive days take place over historic trails, such as the Pony Express Trail, the Outlaw Trail, the Chief Joseph Trail, and the Lewis and Clark Trail. The founding ride of endurance riding, the Western States Trail Ride or "Tevis," covers 100 miles of the famous Western States and Immigrant Trails over the Sierra Nevada Mountains. These rides promote awareness of the importance of trail preservation for future generations and foster an appreciation of our American heritage. For more information please visit us at www.aerc.org. Here, this morning, I am going to have a temper tantrum of massive proportion to express my disgust and frustration. The American Endurance Ride Conference (AERC) Board of Directors is expressing anger and disgust following reports of three equine fatalities which occurred at a national Concours Endurance Nationale (CEN) event held in Abu Dhabi January 31, 2015. Horrifying photographs show Splitters Creek Bundy, a 12-year-old Australian-bred gelding, collapsing into the sand with catastrophic fractures of both front legs, while vehicles and onlookers continue along the course. The bay gelding had failed to finish in his last three competitions, all held in the United Arab Emirates, but had previously been raced seven times at distances from 80 to 120 km (50 to 75 miles) at an average speed of 22.6 km/hr (14.04 mph). The flat, non-technical courses in this region have been criticized worldwide for their emphasis on punishing speed and increasing rates of forelimb fractures, many of which remain unreported by relevant national and international governing bodies. Endurance riding, which AERC can claim originated in the United States almost 60 years ago as an organized sport, is sanctioned internationally by the Federation Equestre International (FEI). The United Arab Emirates (UAE) is a member of FEI Regional Group VII, which has drawn harsh international criticism for repeated reports of equine abuse, positive drug tests, and illegal switching of both horses and riders during competition. While FEI instituted new rules to improve equine welfare in August 2014, forward measurable progress remains slow. When pressed by journalists in regards to the three equine deaths at the Abu Dhabi competition, representatives of FEI stated that the Al Reef race was a national event and thus out of their jurisdiction. AERC’s board members strongly condemn the continuing trend within some Group VII participants towards rule violations and the racing of horses at blistering speeds leading to chronic injuries, fractures and death. The 26-member board urges USEF and FEI to demonstrate their previous commitments to change and reform the egregious offenses occurring within the international arena of endurance riding. Somewhere in the craziness of what mind I have left, I decided to put on an endurance ride. I settled on the name of Owyhee River Challenge because you ride from the Succor Creek area to the Owyhee River for a vet check. And then back over the hills to camp. After a vet check in camp you have an easy 10 mile loop through Succor Creek Canyon. The 25's will have two short loops with vet checks in camp. I even have some wonderful volunteers lined up but need more. Only during the winter I kept coming up with more ideas! A Ride & Tie Friday! We are excited to announce EasyCare is now accepting applications for Team Easyboot 2015. Team members will be selected based on their knowledge of the EasyCare product line, their diversity of riding activity, and their influence in their community. Represent EasyCare in a professional and positive manner. Actively promote and inform others about all EasyCare products and help others in the field. Be available to assist in boot fitting and to provide advice in person and online. Blog once a month on the EasyCare corporate blog. Actively participate with positive interaction and product advice on the Easyboot Facebook page. Wear Team Easyboot attire at events. Display Team Easyboot logo on tack, trailers and vehicles. Access to discounted EasyCare product for personal use. Access to the EasyCare staff for general booting education and problem-solving. Note: Product purchased through the Team Easyboot discount program is for personal use only and cannot be resold. If you would like to be considered for membership on Team Easyboot 2015, please answer a few basic questions in our online Application Form. Applications will be accepted until 10:00 PM Mountain Standard Time on Friday, February 13, 2105. Members of Team Easyboot 2015 will be selected by a panel of EasyCare staff. The new team members will be announced on Monday, February 23, 2015. 2015 Convention 'Cast: Endurance is For Everyone! AERC and Endurance.net will be teaming up to bring you live updates from the 2015 AERC convention in Reno. If you can't make it, tune in! We'll have tweets and vine video clips and photos throughout March 6 and 7, including the Saturday night National Awards ceremony. Kind of like a live coverage of the Oscars and behind the scenes, only better: AERC endurance style! ***AMENDED - this post previously said the hashtag for the convention would be #aerc2015. It is now #2015aerc. Otherwise you'd also be getting tweets from a non-horsey Rheology convention in France!